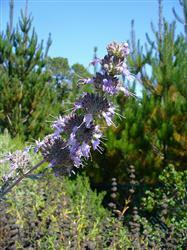 This sage has light purple flowers and has a scent better than either White Sage or a Cleveland Sage. It has similar foliage to a white sage but has slight differences. It is a very attractive shrub to place alongside pathways and along fences. My Vicki Romo is HUGE. I have been training her to stay within the space I planted her in (giving her about 4 square feet to spread but if I had let her go unchecked, I have no doubt she would have spread to 6-8' out. She is around 5' but her flowers go up another 2' making her 7' tall! She is the happiest plant I have in my garden going by her size.